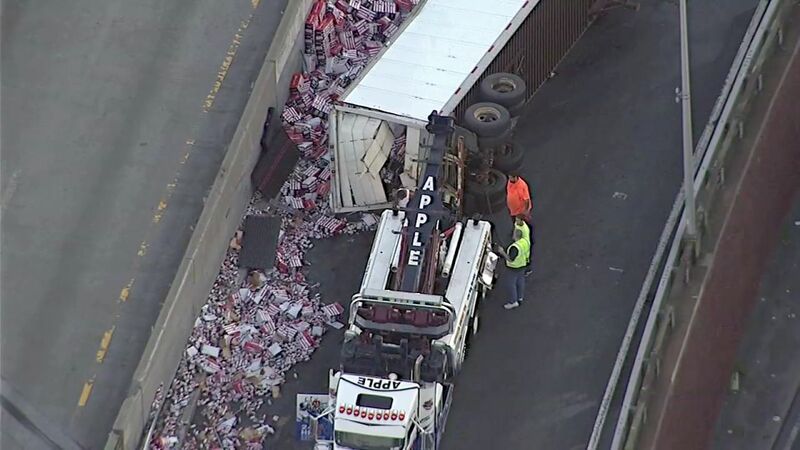 NEW YORK (WABC) -- A tractor-trailer carrying beer overturned on the Brooklyn-Queens Expressway Monday morning, causing major problems for the rush hour commute. All northbound lanes of the BQE and one southbound lane were shut at Hamilton Avenue after the crash at about 3:45 a.m. on a ramp of the Gowanus Expressway to the northbound BQE. A Budweiser truck overturned in the northbound direction at Hamilton Avenue, spilling its cargo all over the roadway. There was also a fuel spill which complicated the cleanup. Newscopter 7's John Del Giorno was over the scene. The driver of the truck is hospitalized in stable condition. The accident caused extensive delays on the inbound side of the Gowanus and northbound BQE, going back all the way towards the Verrazano Bridge. The trailer had to be suspended between two tow trucks and flipped upside down for the cleanup efforts.